I recently picked up Adventure Time Season 4 on Blu-ray and one of the bonus features is a cool little behind-the-scenes look at the music behind the show. The best part of all is this bit where the show’s creator, Pendleton Ward, talks about a boy band that he was in called Bloody Burbanks with some of AT’s producers. He begins belting out a sweet pop tune which then gets a funky beat dropped on it and it’s nothing short of mesmerizing. The actual song goes on longer in the bonus features than it does in the clip embedded above. I’d recommend scooping the DVD or Blu-Ray just for this alone, but there’s also some ballin’ commentary for any aspiring artists/animators/cartoon fans to dig on. 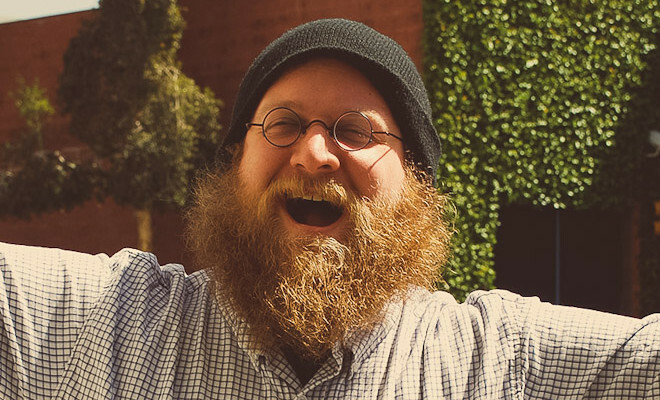 Oh, and if you’re feeling up to it, you should also read my really awkward interview with Pendleton Ward here. Whenever I think about it, I want to draw a picture of him as a cute little pea.